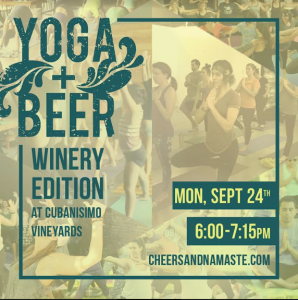 Calling all wine loving yogis! Join us for our winery edition of detox and retox with Yoga + Beer instructor, Jaime Lawrence. Come for an all levels, outdoor yoga class and then stay for a glass of wine. Please bring your own yoga mat. We will be selling wine before and after class. Food will not be available for purchase, so we recommend bringing a picnic to enjoy after class. – Cost: By Donation. Pay what you can for class – with a suggested donation of $5 per yogi. You can make a donation when you register for class – or you can do so the day of class. Tokens of gratitude (i.e. chocolate, thank you notes, coffee cards, homemade gifts) are also accepted. – Wine is available for purchase before and after class.